Yet another follow up on the March 2017 survey (check out our last article about AMD/nVidia and Free/proprietary drivers too). Now looking at what GPU Linux gamers are using (or were using about 3 months ago), and how it compares with the situation one year ago in March 2016. The below graphs represent the top10 nVidia GPUs used by (nVidia) Linux Gamers. On the whole, the 970 still reigns while it has lost some market share. I think one explanation for the fact that there are still a substantial amount of folks (including myself) still on that GPU is that it’s well good enough for all games out there, even the latest ones. While the percentage is much lower, the share of 980 hasn’t move much either, probably for the same reasons. Folks who were on the 750 Ti, 770 and 760 have by large upgraded to a newer card. Again it makes usually a lot more sense to update once you wait for 2 generations (you see a lot more gain for the same kind of purchase), and my guess is that by March 2018 the 970 will have lost its first spot in the list. 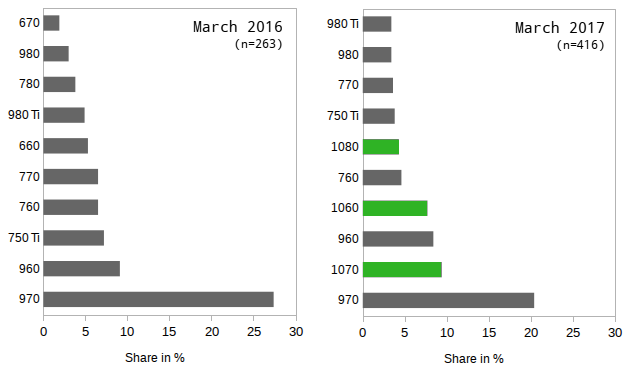 One more aspect to look at is the share of new Pascal GPUs. 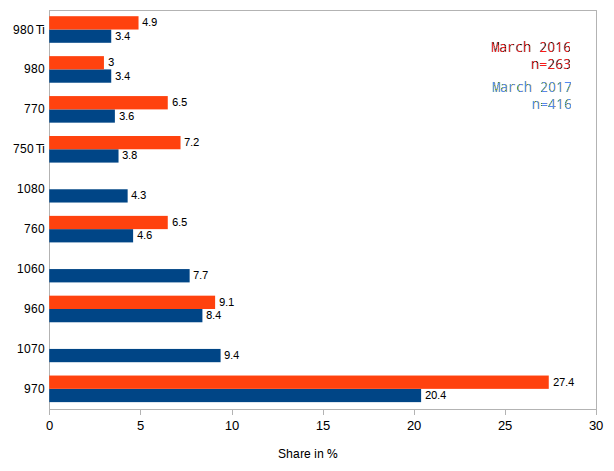 In the matter of one year, that share went form nil (since they were not available) to about 24%. (1070, 1060, 1050 and 1050Ti and 1080 and 1080 Ti combined – not all are shown in the Top10). That’s a pretty fast adoption rate. While faster GPUs with high performance are getting more widespread, recommended specs for recent games have become pretty demanding as well. 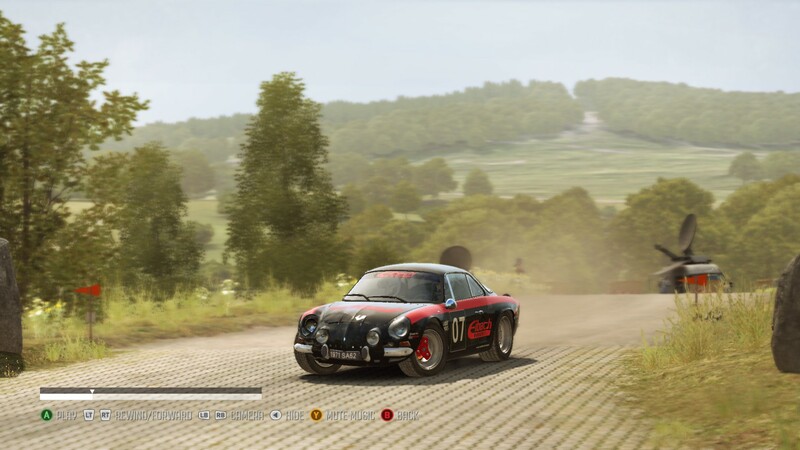 For example, a game like Dirt Rally, released in Q1 2017, required a GTX970 GPU or above to hit the recommended specs. How many folks (with nVidia cards) could actually play at this kind of level when it was released? Last year the GPUs with 970 graphics level and above constituted about 35 % of the nVidia users pool. In March 2017, the percentage went up to 49 %. So when Feral or other porting companies target this kind of specs, they could already be splitting their potential sales by about half. And that’s only for nVidia users. We can also consider the case of Dawn of War III, with the recommended specs indicating at least a GTX980 Ti or above. Back in March 2017, that meant that just about 17.5% of the nVidia Linux gamers could play at the recommended specs. Of course, in reality, even users with less powerful GPUs will buy and play the game at reduced graphical settings (I played DoW III with a 970 and it is mostly fine at high settings), but this gives an idea of how many folks are able to play the game “as it was designed“, with the best framerate possible. But the problem goes deeper than that, for Dawn of War III. At release, the game did not support AMD nor Intel GPUs. This reduces the market to 70% of Linux gamers (20% are on AMD and about 10% on Intel), from which you can take a 17.5% of. This represents only about 13% of Linux gamers who can buy a game at the recommended specs and supported hardware. This is why having ports that run at the best possible performance is important. Of course it’s always possible to recommend gamers to go for a more expensive card for a better experience, but this is just going to shrink the number of folks who will be able to purchase your game at release, making every port even less profitable since Linux gaming is already a small market in itself. I certainly hope we won’t see any games requiring “GTX 1070 and above” as recommended specs anytime soon, since there is currently less than 15% of such hardware among Linux Gamers using nVidia.